The Bernina Model 200 "Sewing Computer"
In the Fall of this year The Fabric Fair of Bay City began publishing an expanded version of their news letter. 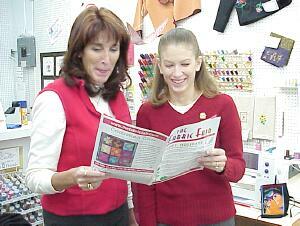 "The customer response has been fantastic", said Cel Wieland, owner of The Fabric Fair. "The new format gives us room for more articles, announcements and pictures, and everyone loves that we went with full color". Since buying The Fabric Fair at the beginning of the year, Wieland has made many changes and improvements. "With so many new things happening, we need to be sure that our customers are kept informed. Our store is so much more that just fabric. We have a complete sewing machine department and reapir service. We sell the full line of Bernina machines, including the new Artista 200 "sewing computer". We offer classes from beginner to advanced, clubs, guest speakers, and soon we'll host sewing retreats. I wanted a newsletter that would make a lasting impression, and that's what we've done." To meet Cel's goals, the newsletter needed to be redesigned from the ground up. The end product was to complement The Fabric Fair's new web site, which would include an electronic version of the publication. The mailing list was to be automated for in-store updates then transfer over the web to the printer. All components needed the ability to interface to the computerized point of sale system and to an e-commerce system planned for the web site. The Fabric Fair contracted with OJ Advertising (which also publishes MyBayCity.com) for the job. Graphics Designer Suzy McAlester, from OJA, was given the job of conceptualizing the print news letter. OJA's technology division, Mid-Michigan Computer Consultants was given the job of web site design, mailing list management, and point of sale system integration. The end product "is everything that I wanted", said Wieland. "But we're not done", she continued, "It's working so well that it's given us lots of new ideas. Just wait until you see our next idea !"